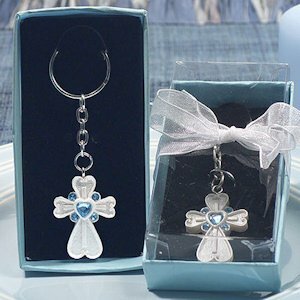 For a baptism, christening or even a wedding, remind your guests of your belief with a stunning cross key chain. A pearlized white resin cross is embedded with 4 blue crystals and accented with a heart shaped stone in the center. Comes attached to a metal key ring and chain, and measures 4" long. 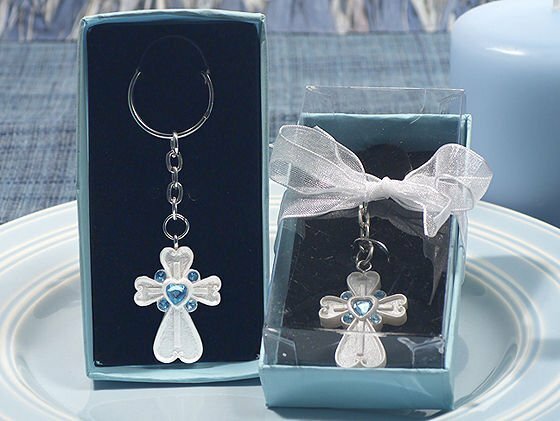 Each cross key ring is packaged in a blue gift box with velvet lining and wrapped in organza ribbon making it ready for giving to your guests.